Supplementary material reads: Reay -- Photographer: Glickman. Captions: San Fernando Valley feature for Jan. 2. 119-120: Panorama from above Sherman Oaks, looking north. Fred Weddington, 72, pioneer of North Hollywood, points out picture of first store of 1890's to George Tonn, 9. 6216 Simpson Avenue, North Hollywood. Tonns came here 5 years ago from New York because of Valley's fame for healthful climate. Fred Weddington, 72, alone. 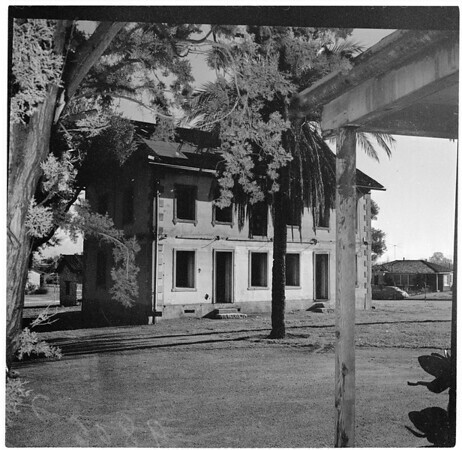 De la Osa Adobe at Encino. Ted Gibson, first postmaster of Encino, and James E. Richardson, deputy ranger of this state park. Long low building was erected in 1849. Two story building was erected in 1969. (Also inspecting grinding stones on porch of the older building. 121-122-202: San Fernando Heights Lemon Association -- sorting -- in San Fernando. 203: Picturesque shot of corral on horse breeding farm near Northridge and Chatsworth. Flocks of sheep still sometimes block highways. These sheep wander on Roscoe Boulevard in Canoga Park. 218: Subdivision construction. This is at Parthenia Estates. Worker is Earl Naves, 1161 Orange Grove Avenue, San Fernando. 219: General view of workers at same subdivision. 207-212-213: Chevrolet Plant at Van Nuys. Workers homeward bound. 214-215: Exterior, San Fernando del Rey Mission. Mission Bell at San Fernando Mission, cast 1809. 115-116: Int. chapel at San Fernando Mission (taboo?). 117-118: Brother James Hart in corridor at San Fernando Mission. 119: At Sylmar Packing House, showing olive pickling vats. Frank Lopez and Harold Riley. 120: Same except Harold Riley and Frank Lopez. Picturesque Northridge Southern Pacific station, built 1910, Stationmaster W.E. Freeman, 67, nearest engine. He's been with S.P. since 1906, was stationmaster at nearby Santa Susana in 1908."